After eyeing and stroking several bolts of soft bamboo flannel, for almost a year of visiting it in a fabric store, I finally bought some. Several years ago I was in a shop that featured bamboo products from clothing to household goods, soaps, candles, furniture, and more, I remember how soft the towels and sheets felt, but the oh, the price, so I put it out of my mind. Lately, the fabric stores have been selling a bamboo flannel fabric and I have noticed how much softer it felt to the touch than the other natural woven fabric flannels normally used for nightwear. Preparing the fabric: after washing and drying the fabric, the cut edges became very shredded, stringy and knotty. 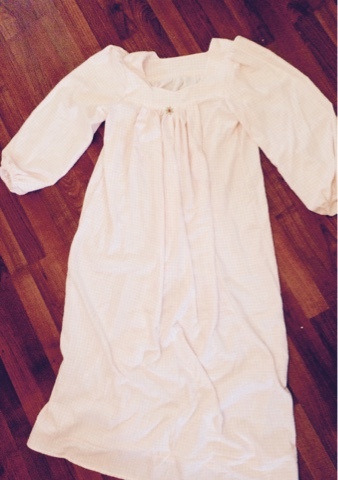 It was wrinkley but easily ironed, and would wrinkle every time it was moved. 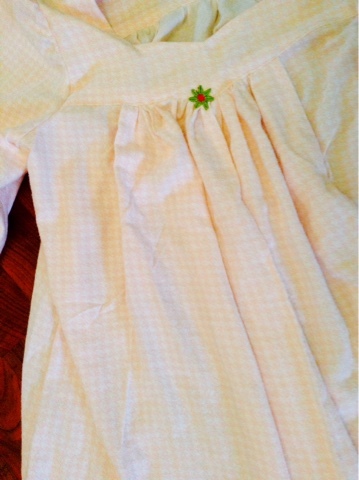 After discovering the method of creating "permanent press" I don't mind wrinkled fabric at all. It has less chemicals in it. Laying out and cutting: Bamboo fabrics come in many different weights and types, and not all of them are flannels. I used the metal weights to hold the fabric and pattern steady while I cut. The fabric was kind of slippery but I was undaunted in my enthusiasm for the finished garment. It cut very easily with sharp scissors and behaved like a fine cotton. Machine sewing: It was more like working with rayon or a polyester, because it had bias all through it and a lot of stretch. That made it easier to match up some notches and seams. I could have used a special ballpoint machine needle for knits. Although it was a woven fabric it was slippery like a knit. Hand sewing: holds together better with machine stitches. Un-picking: While it is easy to unpick stitches on stable cottons, unpicking this bamboo flannel was more difficult and it was easy to put a hole in the fabric. It is delicate, yet strong. Ironing: hot steam pressing worked well and didn't melt the fabric. Warmth and coverage: this could be worn in summer and not feel too hot, as the fabric is thin. Prior to sewing, I did not even think to look up how to sew bamboo fabrics, so I probably missed something. However, the garment is holding together fine and is very soft. It wrinkles a lot more but straightens out when hung on a hanger for just a few minutes. The fabric is thinner than flannel; more like muslin. On the bolt it seems thicker but once it is washed and ironed it seemed a lot more delicate. As this is made for someone else, I have not worn it. It is so incredibly soft and natural I know it will be very comfortable. This is the only pencil they left me to make my shopping and to-do list. 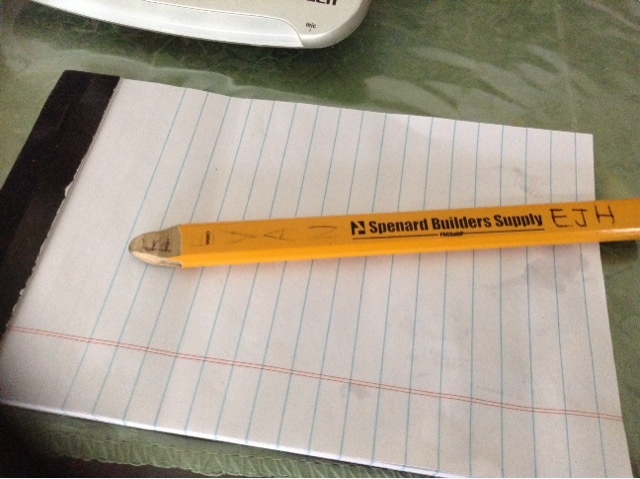 Have you ever had to write with a carpenter pencil? I must say, we aren't very advanced. My father and grandfather used these, and STILL there is NO SHARPENER invented! The common kitchen paring knife just does not do it well, and the old fashioned pocket knife is what they used. I just had the sweetest memory of my dad marking boards with one of those pencils...thank you. I enjoy your blog so much. Yes indeed! I too have been left with just a carpenter pencil to use in the past. your post is quite interesting. I've never seen bamboo fabric for sale in the fabric shops before. What shop did you find it in? I have seen bamboo sheets for sale before and considered buying a flat sheet to try sewing with. However the price was too dear. 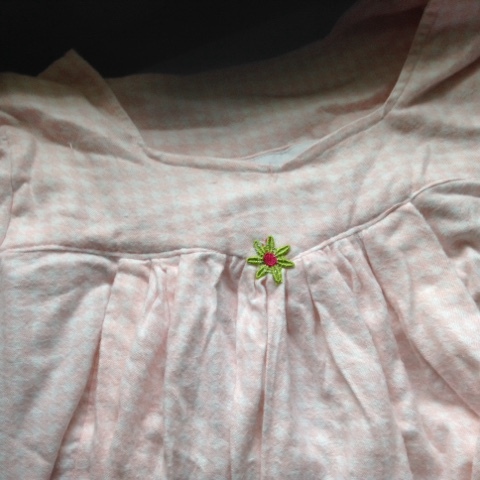 Loved the darling gown you made and embroidered a daisy on the front. How do you get a permanent press finish from your bamboo fabric? My father was a land surveyor and he used those carpenters pencils a lot to marks and such. I remember them well. The grandchildren in our family love using colored pencils for coloring, and using a small hand sharpener was labor intensive. I finally invested in an electric pencil sharpener. All I need do now is empty it. The flannel bamboo fabric is at Walmat sewing department . There is a pencil sharpener for carpenter pencils but not electric. However most users of carpenter pencils prefer to sharpen with a knife. That fabric sounds lovely! Very pretty too!